One reads: "Cluck Old Hen" is a popular Appalachian fiddle and banjo tune. It is played either as an instrumental or with lyrics, which vary from one version to another. One of the earliest reported transcriptions of the tune dates from 1886. The earliest recording is attributed to Fiddlin' John Carson, in 1923. 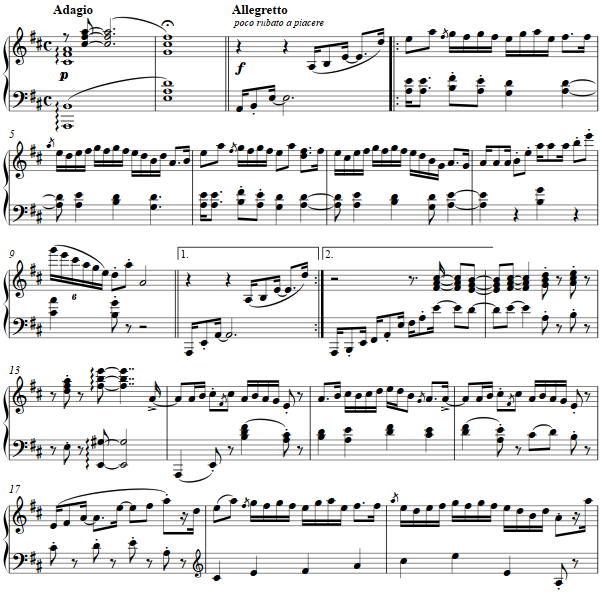 This essay for piano is based on Alan Jabbour's transcription as found in the Library of Congress, "Fiddle Tunes of the Old Frontier: The Henry Reed Collection." Of lyrics for the tune, a sampling is "...Cluck old hen, cluck and sing / Ain't seen an egg since way last spring / Cluck old hen, cluck and squall/ Ain't laid an egg since way last fall... and ...My old hen's a good old hen / She lays eggs for the railroad men / Sometimes eight, sometimes ten, / That's enough for the railroad men...." And ending sentiment darkly says: "Cluck old hen, cluck in the lot / Next time you cackle, you'll cackle in the pot."